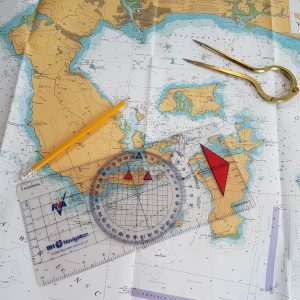 RYA Day Skipper Theory on-line course provides a useful introduction to Chart work, Collision Regulations, Lights & Shapes, Meteorology, Pilotage and more. GPS Navigation is covered, as well as working up estimated positions and dead reckoning. Safety procedures and anchoring are also covered. The on-line course allows you to work at your own convenience and pace. It is compatible with most devices allowing you to study anywhere. You can start the course anytime to suit you. There is a 6 month access period with an admin fee of £30 to extend it. Online back up and land line telephone backup as required by each student and every endeavor will be made to help students achieve their aims. Course pack will be sent to you containing log in details and navigation tools. You will be guided through all you need to enhance your boating knowledge. The course covers charts and publications, safety, buoyage, tidal awareness, basic navigation and pilotage, rules of the road, electronic navigation, anchoring, weather forecasts, and passage planning.